Recently Cartoon Sara (The First Lady of Comicazi and Supreme Maker of Logos) and I went on a trip to Atlanta to do some sightseeing. While there is a lot to see in Atlanta, in the interest of remaining honest, one of the the main reasons we chose Atlanta as the place to see was the chance to make a trip to the Center for Puppetry Arts. Sara is along for the ride on this blog post since she has a much better memory than I do. So here goes, Sara and my (well, mostly Sara's) walk-through/review of what’s to see at the Center. My comments are in blue. Founded in 1978 by puppeteer Vincent Anthony, the Center for Puppetry Arts is the largest American organization devoted exclusively to the art of puppetry. The building houses both a museum and a theater showing a wide variety of productions for both children and adults. Throughout the year, The Center plays host to a variety of workshops, festivals, and conferences, drawings fans and talents from around the globe. Our first stop was the main exhibit hall, which provides a general overview of the history of puppetry. The collection features a wide variety of beautiful and fascinating puppets from around the world, from simply hand puppets to more complex rod puppets and marionettes to intricate shadow puppets to massive full body puppets. The exhibit is at it best when it succeeds in putting the puppets in context, using text, videos, and the occasional diorama to explain how the puppets are operated and what kind of performances they were used in. Unfortunately, portions of the exhibit hall are poorly lit. making some of the signage hard to read. I ended up feeling that there were just too many puppets without enough information to help me understand why they were important. A slightly smaller selection of puppets with more explanation of the performances they were used in might have been more informative. One of the strangest parts of the main exhibit was the second room we entered. The room is set up to look like a storage area in the backstage of a puppet theater: wooden shelves crammed full of puppets of all sorts. It’s a very small room and very quiet. We were trying to decide whether the overall effect was magical or creepy when, without any forewarning, a random puppet started to move. It was not magical. It was terrifying. We took off for the next room as fast as possible, and suggest that you do the same should you ever decide to visit the Center. Might I also add that there are even puppets behind glass panes in the floor. This adds a creepy layer of lonely imprisoned puppets attempting to look up your skirt. Of course, the main reason Smalerie and I made this trip was to see Muppets and other Henson creations. While most of these can be found in the museum’s other two exhibit halls, there is a can’t miss collection right near the end of the main exhibit. Our reward for braving the Room of Scary Puppets was a face to snout encounter with Captain Link Hogthrob and the mercurial Dr. Strangepork from the “Pigs in Space” segments of The Muppet Show. These may not be the most intricate puppets in the Henson catalog, but seeing them up close reminded me of just how much work goes into crafting even a relatively simple Muppet, from selecting the right fabrics for the character’s skin, costume, hair, and the like to executing the little details like the maker-drawn pig faces on the chest emblems. If you want to see one of the most intricate Henson puppets, all you have to do is turn around. 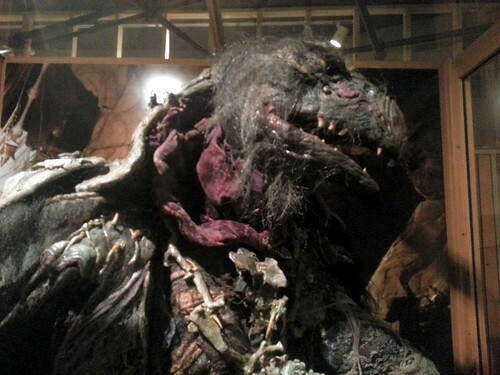 Towering over the other puppets in the room is the fearsome SkekUng, he fearsome skeksis garthim master and newly crowned emperor from Henson’s fantasy epic The Dark Crystal. A full body puppet, SkekUng is so packed with detail that you could easily spend ages just looking at his craggy, vulture-like face, his gnarled hands, or sections of his garments. One of the distinctive swords from the Trial By Stone is displayed alongside SkeUng, serving as a reminder of the care that went into designing every aspect of the world of the film. I was disappointed to discover that SkekUng’s freestanding display case was walled off on two sides. These puppets were designed to be viewed from just about every possible angle and I really wanted to be able to see all of SkekUng. Still, there was plenty to enjoy in what I could see. Right now, SkekUng is the only representative from The Dark Crystal on display at the Center, but I’ve heard that one of the four-armed Mystics is being restored for possible future display. After finishing the main exhibit hall, the remainder of the exhibits are merely a sneak peak of the 500+ piece collection that Jim Henson company donated to the center in 2007. What you can see now is a VERY small percentage, but most of the pieces on display are truly iconic and quite a thrill for any Henson fan. 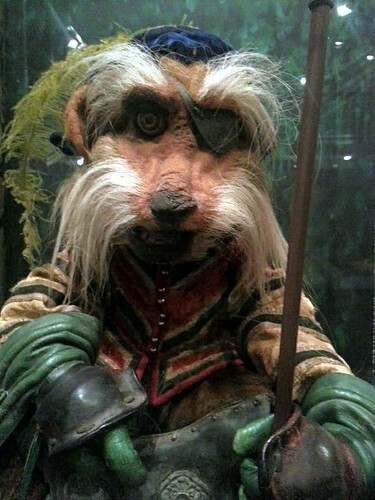 The Jim Henson: Puppeteer exhibit focuses - not surprisingly - on the puppets performed by Henson himself. Kermit is present, of course, as is Ernie. But the exhibit also gives plenty of space and focus to less famous characters. Dr. Teeth sports his trademark outfit that left me marveling at the skills of the puppet fabricators tasked with putting it together. The Swedish Chef pays tribute to the frequent collaborations between Jim Henson and fellow puppeteer Frank Oz. (Henson puppeteered the Chef’s head and performed his voice while Oz provided the Chef’s hands.) Canine mobster Bugsy Them from the Jim Henson Hour segment “Dog City” can be found near a booklet of amazing development sketches of early concepts for Dog City and its citizens. Additional highlights include a hand-puppet sized LaChoy Dragon with a glowing letter of thanks for Henson’s work on the LaChoy advertising campaign, a puppet likeness of Henson as a member of the Country Trio, and various design sketches by Henson of different puppets. A large screen in the back of the room shows highlights of Henson performances, ultimately the best way to appreciate his skill as a puppeteer. If that's not enough Muppets for you (and really, can there ever be enough Muppets? ), a second Muppet-centric exhibit can be found right next door. Jim Henson: Wonders From His Workshop shows off still more iconic Muppet characters while demonstrating some of the more technical aspects of the puppeteering craft. The puppets and techniques in this exhibit range from relatively simple puppets like Cookie Monster to the state of the art digital puppeteering of Sid the Science Kid. It's a thrill to see a full sized Big Bird puppet in any context, but here you get the added benefit of an explanation of the pulley system that operates his right arm. (Big Bird is left-handed, allowing the puppeteer to control Big Bird's head with his right hand.) Fans of Fraggle Rock will be happy to find the show well represented. There are several Doozers, a full sized Red and Mokey, and small sized remote controlled versions of the main Fraggle cast for use in scenes where the Fraggles were interacting with the Gorgs. A nearby section features reproductions of concept artwork from the Henson workshop surrounding a video with behind the scenes footage from various Henson productions. All of it is a really interesting look inside the process of making these puppets come alive, but the video is far too long to stand around and watch in its entirety. Splitting it between multiple screens around the exhibit would have been a better choice. A word to the wise for those of us who might be very attached to some of these characters. Latex does not last forever. After time it will dry out and crack. The same is true for the foam and felt puppets. Use wears them down. Principle characters are fabricated over and over again so Ernie looks as bright as you remember him, but characters used for movies and specials get only made a few times. Once the movie/special is done, they are kinda out of rotation. My point is that you might notice some sad crumbly hands or a squashed nose. In some cases, even missing items from the clothes. When the items were stored, something tells me that keeping them at museum quality wasn’t really a priority. This only drives the point even more about how lucky we are to get a chance to see them at all. Oh and for the diehards out there, Emmet Otter makes an appearance as well. Those prone to fainting over extreme cuteness might want to approach this display with caution. Seeing Emmet and Ma Otter in the rowboat was my Sir Didymus moment. Emmet Otter’s Jugband Christmas has become increasingly special to me over the years, so seeing them in person was almost too much, even before you consider the cuteness factor. Since this part of the museum is about Henson technology, the puppets are there to represent the then-revolutionary remote controlled puppetry used in the special. It’s fascinating to read about, but the technical wizardry was dwarfed by my emotional reaction to seeing favorite characters up close. Smalerie’s final take: If you find yourself in Atlanta, there is not a question in my mind that you should stop by the Center. Supporting the arts is always important and it isn’t that often you get to directly support puppetry as an art (other than going to see an actual puppet show of course). For those of you who might consider making the trip JUST to visit the center, my advice is to wait a bit. While impressive, you can pretty much see everything they have in about an hour and though the promise of growth is exciting, it would probably be much more fun to see the grander plan. That being said, the Center is easy to find and a great addition to any more general sightseeing trip to Atlanta. Cartoon Sara’s semi-final take: The Center’s new Jim Henson wing is scheduled to open sometime in 2014. This is not too long to wait for the promise of literally hundreds of puppets, plus assorted other artifacts from the Henson archives. But as Smalerie said, the Center in its current form is a must-see stop as part of a larger Atlanta visit. While we weren’t able to catch a show at the Center’s theater, I imagine it would be a great way to expand your visit and experience the art of puppetry in action. 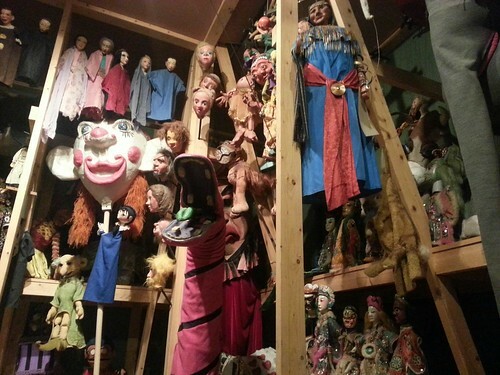 Whether you go to learn more about the techniques of puppetry, to admire the puppets as beautiful art objects, or to see characters you’ve known since childhood, you won’t regret paying the Center for Puppetry Arts a visit.